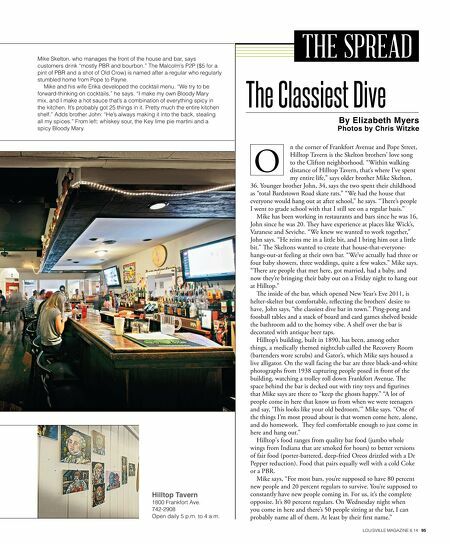 LOUISVILLE MAGAZINE 8.14 95 By Elizabeth Myers Photos by Chris Witzke The Classiest Dive THE SPREAD Hilltop Tavern 1800 Frankfort Ave. 742-2908 Open daily 5 p.m. to 4 a.m. Mike Skelton, who manages the front of the house and bar, says customers drink "mostly PBR and bourbon." The Malcolm's P2P ($5 for a pint of PBR and a shot of Old Crow) is named after a regular who regularly stumbled home from Pope to Payne. Mike and his wife Erika developed the cocktail menu. "We try to be forward-thinking on cocktails," he says. "I make my own Bloody Mary mix, and I make a hot sauce that's a combination of everything spicy in the kitchen. It's probably got 25 things in it. Pretty much the entire kitchen shelf." Adds brother John: "He's always making it into the back, stealing all my spices." From left: whiskey sour, the Key lime pie martini and a spicy Bloody Mary. 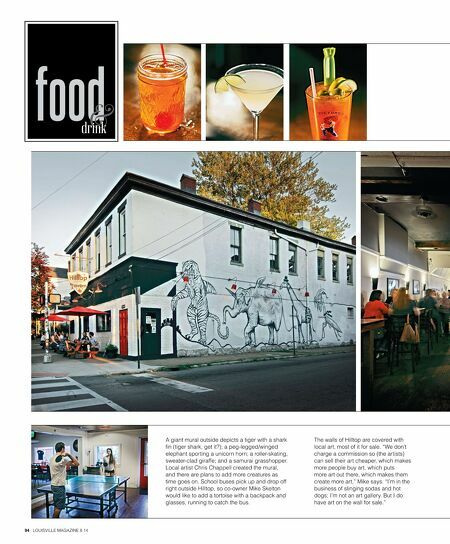 O n the corner of Frankfort Avenue and Pope Street, Hilltop Tavern is the Skelton brothers' love song to the Clifton neighborhood. "Within walking distance of Hilltop Tavern, that's where I've spent my entire life," says older brother Mike Skelton, 36. Younger brother John, 34, says the two spent their childhood as "total Bardstown Road skate rats." "We had the house that everyone would hang out at after school," he says. "Tere's people I went to grade school with that I still see on a regular basis." Mike has been working in restaurants and bars since he was 16, John since he was 20. Tey have experience at places like Wick's, Varanese and Seviche. "We knew we wanted to work together," John says. "He reins me in a little bit, and I bring him out a little bit." Te Skeltons wanted to create that house-that-everyone- hangs-out-at feeling at their own bar. "We've actually had three or four baby showers, three weddings, quite a few wakes." Mike says. "Tere are people that met here, got married, had a baby, and now they're bringing their baby out on a Friday night to hang out at Hilltop." Te inside of the bar, which opened New Year's Eve 2011, is helter-skelter but comfortable, refecting the brothers' desire to have, John says, "the classiest dive bar in town." Ping-pong and foosball tables and a stack of board and card games shelved beside the bathroom add to the homey vibe. A shelf over the bar is decorated with antique beer taps. Hilltop's building, built in 1890, has been, among other things, a medically themed nightclub called the Recovery Room (bartenders wore scrubs) and Gator's, which Mike says housed a live alligator. On the wall facing the bar are three black-and-white photographs from 1938 capturing people posed in front of the building, watching a trolley roll down Frankfort Avenue. Te space behind the bar is decked out with tiny toys and fgurines that Mike says are there to "keep the ghosts happy." "A lot of people come in here that know us from when we were teenagers and say, 'Tis looks like your old bedroom,'" Mike says. "One of the things I'm most proud about is that women come here, alone, and do homework. Tey feel comfortable enough to just come in here and hang out." Hilltop's food ranges from quality bar food (jumbo whole wings from Indiana that are smoked for hours) to better versions of fair food (porter-battered, deep-fried Oreos drizzled with a Dr Pepper reduction). Food that pairs equally well with a cold Coke or a PBR. Mike says, "For most bars, you're supposed to have 80 percent new people and 20 percent regulars to survive. You're supposed to constantly have new people coming in. For us, it's the complete opposite. It's 80 percent regulars. On Wednesday night when you come in here and there's 50 people sitting at the bar, I can probably name all of them. At least by their frst name."